You can see from the calculation above that Marcus will receive approximately S$329.53 eachmonth (illustration above is based on a month with 31 days), just for meeting the four criteria mentioned above. This equates to S$3,888 in a year. 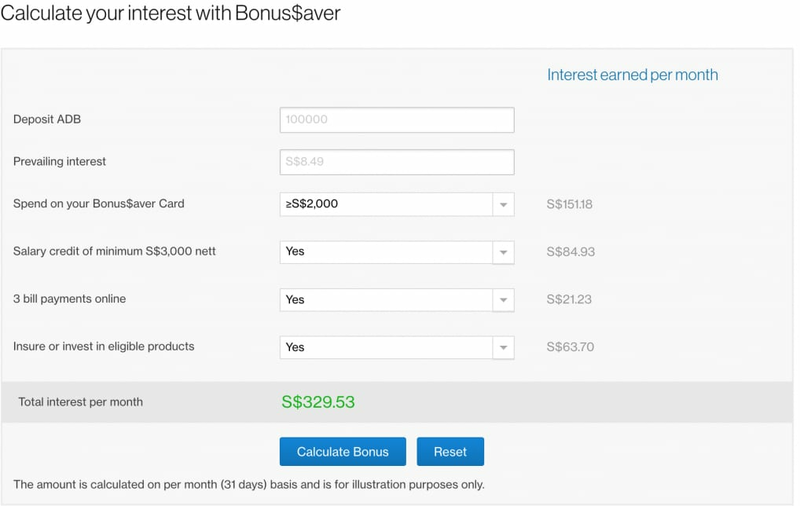 To sum it up, we think that the Bonus$aver account is the account you should be going for if you 1) have a take-home salary of S$3,000 or more, 2) spend at least S$500 each month on your card,and 3) have three bills (minimum S$50 each) to pay each month. This article is written in collaboration with Standard Chartered Bank (Singapore) Limited. All views expressed in the article are the independent opinions of DollarsAndSense.sg . All information provided is for informational purposes only and is not intended to be construed as advice or an offer for any product or service. Standard Chartered is not liable for any informational errors, incompleteness, delays, or for any actions taken in reliance on information contained herein. The article is accurate as [at the time of its original publication on DollarsAndSense.sg . Visit [www.sc.com/sg/save/current-accounts/bonussaver/] for more information on Standard Chartered’s Bonus$aver. This article was originally published on DollarsAndSense.sg on 27 April 2018.